Ever dreamed of going on a safari? Then fasten your seat belt, start the engine, and hit the road. Any road. I’ll bet you dollars to donuts—take the time to look and you’ll spy enough wildlife to satisfy, Bwana. Sure, some of the creatures will be easier to spot than others… for the simple reason they’re no longer moving. But I’m not proposing a road-kill road-trip. Trust me, the city streets, shady neighborhood boulevards, highways and byways offer plenty of opportunities for wildlife watching. Naturally, the species on display depend on the size of the road, its location, the season, time of day, and the speed limit. Let’s say your motoring down a divided highway, a conduit to and through the all-American suburbs. The big stuff (aka megafauna), such as deer, elk, moose, bears, and even coyotes, can be seen at 65+ mph (although not always in time to either admire or avoid them). Certain birds of prey, red-tailed hawks in particular, can be seen at both speed and distance due to their habit of hanging out high on handy utility poles to scout for snacks. Anything more petite will be visible only if it’s on the shoulder or trying to cross the road. Scavengers looking for a free lunch can be seen out on the open road day (crows, ravens, vultures) and night (opossums, coyotes). That meal ticket can quickly turn the diner into dinner for someone else… and so on. Beyond mowed blacktop borders, in the woods and taller grasses, you’ll find rabbits, foxes, raccoons, skunks, and groundhogs. Based on my own non-scientific observation, to improve your chances of seeing these meso– (medium-sized) species as well as small but brightly colored male songbirds in situ you’ll have to ease up on the gas pedal and let the speedometer drop to 35-45 mph, tops. A bicycle (or even a horse if you have access to one) would probably set the right pace for a rider to notice mice and voles, lizards, turtles, frogs and toads, as well as female songbirds (who tend to have less flashy wardrobes than their ready-for-the-disco menfolk). The truly diminutive critters—insects, spiders, snails and slugs—are hard to spot at more than arm’s length so it’s best to set off on foot and plan for a leisurely pace if spineless quarry is your goal. A general rule: the slower you go, the more you’ll see—that’s what makes the backroads more appealing for this kind of trip than a superhighway. In poetry, novels, song, and cinema people often speak of the allure and romance of roads—the ones that calls us, the ones less traveled, the ones that go on forever, choosing between high ones and low ones. Wild animals rarely have access to books and mp3 players and RedBox kiosks, though, and I’ve never found them to be all that interested in popular culture… so what’s the attraction? To build a road through a previously undeveloped area, the first thing that happens is clearing a swath of the existing plant community, be that trees and shrubs or grasses or cacti. Once the project is completed (or even while it’s still in progress) new plants begin to colonize the bare soil, creating a plant community that’s different from the surrounding landscape along with an edge where new and old meet. Disturbing the soil stimulates the germination of seeds that may have sat dormant for a long time waiting for the right conditions. Soil may be brought in from somewhere else as part of the construction process along with seeds from plants that are completely novel in this setting. Since the plants predict what kind of animals will be found in any ecosystem, the new habitat creates opportunities certain wildlife species will exploit… but in most cases it won’t be the species that were living happily in the pre-construction habitat. 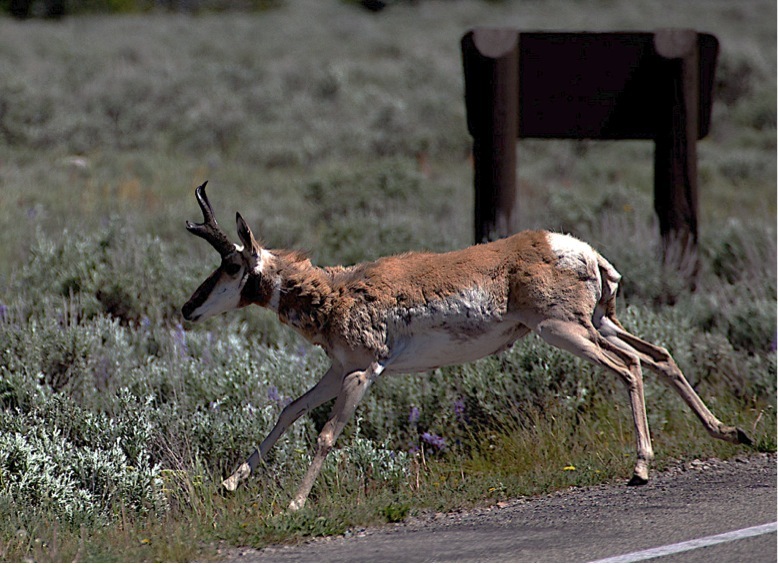 Edge species will colonize the area, often using the right-of-way as a travel corridor before and after the road is completed. 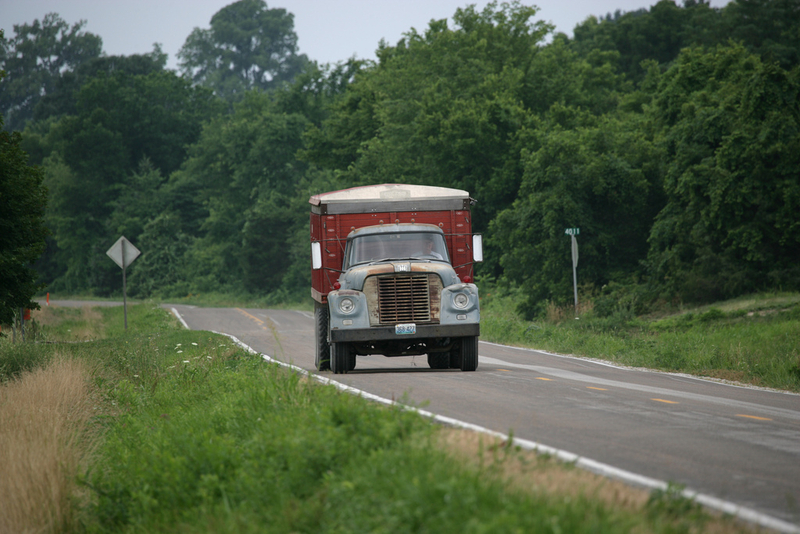 Some organisms will hitchhike to their new home on and in the bodies of larger animals or even motor vehicles. Birds, bats, and flying insects will drop in from above. Wild things are always jockeying for space and there’s no such thing as a vacant lot in nature—at least, not for long. 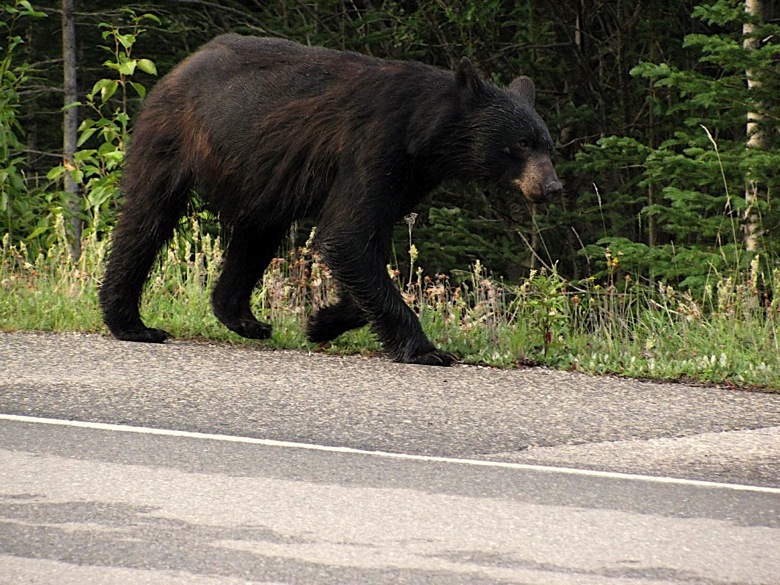 Make no mistake—roads are a significant cause of habitat loss and their presence is detrimental to many types of wildlife. For others, though, the resulting edge provides exactly what they need to thrive. This includes our most familiar next-door nature species. In fact, the reason blue jays, robins, white-tailed deer and other edge-loving species are so common in human communities is because Homo sapiens is also an edge-loving species. Our roads are simply one very conspicuous example of that fact. The natural world is never static; it’s always in flux and each day there are new winners and losers. 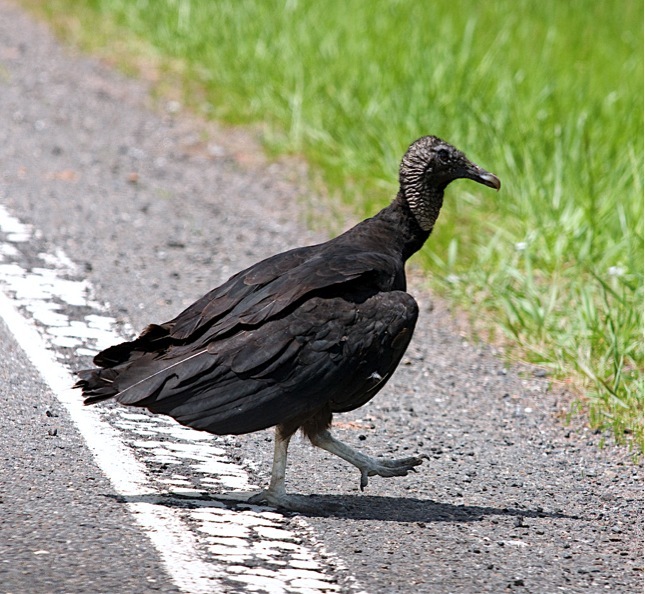 Are roads good or bad for wildlife? It depends on the species. But there’s no doubt they are a boon for wildlife watchers. Life is better with Next-Door Nature—click the “subscribe” link in the upper right-hand corner of this page and receive notifications of new posts! © 2012 Next-Door Nature—no reprints without written permission from the author (I’d love for you to share my work. Just ask first.). 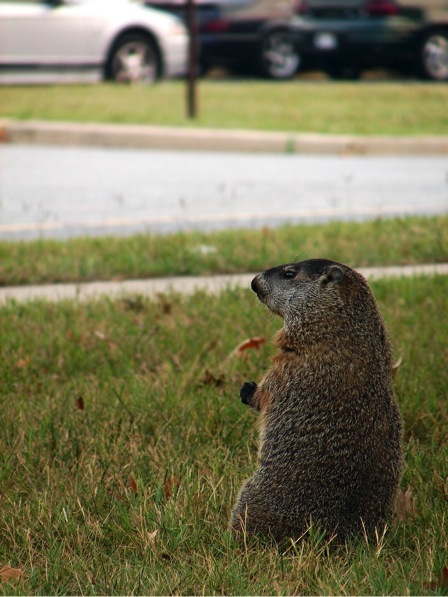 Thanks to these photographers for making their work available through a Creative Commons license: Colleen Greene (black bear); e_monk (black vulture); Matt Reinbold (groundhog); MoDOT Photos (edge habitat); Allan Harris (pronghorn). Sometimes you just need to shut out the world for a while, you know? If you can’t relate, I know the eastern box turtle (Terrapene carolina carolina) certainly can. Whether the threat is carnivores or towers of cardboard boxes and a demanding career, there are times when nothing beats a little self-imposed solitary confinement. Carrying your own personal isolation chamber on your back means sensory deprivation can be achieved in mere seconds. No need to call ahead for an appointment at the local day spa. Don’t bother dimming the lights, closing the blinds, and turning off your cell phone. Just pull in your extremities and slam your hinged shell shut—a little privacy, if you don’t mind! Is it any coincidence that box turtles are one of our longest-lived species, with well-documented cases of individuals reaching the half-century mark and beyond? Stress reductions, in the form of a room of one’s own, may well be the key to attaining a ripe old age. We shouldn’t dismiss the importance of wise food choices either—lots of lean protein, in the form of earthworms, snails, slugs, and insects, as well as fruits and veggies such as berries, grasses, and flowers. Turtles have another favorite food that may contribute to overall longevity—they’ve been known to consume poisonous fungi, causing anyone who dines on their flesh to sicken, or worse. Of course, someone has to kill and eat said turtle, and suffer the consequences, which may not seem like much of a survival benefit unless you consider it from the standpoint of the population rather than the individual. See, all it takes is one or two bad meals and, ever after, turtles become a much less appealing meal for that particular consumer and his or her community. The technical term is adverse conditioning—that’s a polite way of saying animals (both human and non-human) tend not to keep eating things that make us vomit. Now, it’s unlikely that turtles have any particular strategy in mind when eating wild mushrooms. Then again… certain “magical” fungi have been credited with providing, among other things, an increased sense of well-being and decreased anxiety levels. Perhaps they are self-medicating with the Terrapene equivalent of Xanax®. One of six subspecies of the common box turtle (T. carolina), the eastern, like all its kin, has a highly domed carapace (the upper portion of the shell) and a hinged plastron (the lower half of the shell). What sets each subspecies apart is distribution and habitat, as well as certain physical characteristics. T.c. carolina, found from southern Maine to southern Florida and as far west as central Texas, is known for colorful keeled carpaces that feature diverse combinations of spots, bars, and radiating lines. Color provides a clue to more than a box turtle’s species. It can also help us determine the gender of that lurching, resolute reptile we stop to help cross the street. If the eyes (irises) are bright orange or red, you’re holding a male; females have brown or light orange eyes. What if, in response to your good deed, the turtle has gone into hiding, making eye contact a moot point? Simply turn the creature over; females have a flat plastron, males are slightly concave. (Think about it. Birds do it, bees do it…). The hinged plastron is what caused taxonomists to create a separate genus for North America’s box-top reptiles, and what allows the eastern and it’s relatives to retreat into a kind of biological fortress. And for most of their history, this survival strategy worked quite well—against coyotes, raccoons, and skunks, that is. Sadly, it doesn’t provide the same level of protection from every threat. Box turtles are still relatively common throughout much of their range, but not even the most tightly closed shell can shield this species from the impacts of habitat loss and other interactions with Homo sapiens. These are slow moving, slow growing creatures with delayed sexual maturity and low reproduction rates, all of which puts them at risk. A female may produce hundreds of eggs during her lifetime, but less than a dozen offspring can be expected to survive to adulthood. It’s hard to even begin to estimate how many turtles are hit attempting to cross roads every year, and there are plenty of other hazard against which withdrawing into your shell is of little use—trains, lawn mowers, tractors, and bulldozers, to name but a few. Then there’s the capture of turtles for the pet trade. In many states, this practice is completely unregulated, with devastating impacts on wild populations. Even so, there are times when coming out of your shell is the better choice. Especially for humans. Solitary confinement is used as a punishment because, unlike turtles we are social mammals. We need companionship, conversation, to touch and be touched. Hard to get any of those needs met when you retreat to your shell. Unless, of course, you invite someone to join you there.